We all have those days when things get on top and tip our scales too far one way. But instead of taking comfort in the knowledge that there are plenty of quiet corners we can run away to at home, to get back into balance, we convince ourselves that it’s wrong to want to do so. We feel guilty and trapped. But more often than not, these feelings are self-inflicted sufferance of the mind. Not giving ourselves the space we need may worsen our situation, as we become irritable, snappy and even more stressed out. So I did! I escaped from my crazy world for two days and enjoyed it with my husband's company. For sure, even though I don't hear my husband complaining I know he needs one too, but poor him, he can not, and let me repeat, he can not run away from me. Harharhar! And run away we did! The drive to Sta. Cruz, Laguna may have made us a bit dispirited because of the traffic and though we felt confident leaving the household to the kids, we were a little bit worried, well we're parents. But we have decided to give ourselves the gift of rest and solitude. Of course we didn't ask our kids for their approval, but we knew we were able to equip them to do things independently but with utter respect for us. We have dogs to make sure no bad elements can come unrestricted, my son (20 years old) knows karate, all my kids do household chores, my youngest can even bake a damn good red velvet chocolate cake and I have an 18 year old to lead the three siblings. More than that, I know God also intends for us to have spaces for ourselves, even for three hours. I've read once that solitude and stillness create space for the spirit of God to speak. Even God Himself rested on the seventh day after he had created everything, and Jesus together with His disciples went away to find peace. "So they went away by themselves on a boat to a solitary place." In a place where there are no distraction, solace and where nature just wants to commune with you, you will find yourself in stillness, that space where you can hear the Lord clearly and His plans ready to manifest in our lives and you are reminded. This was one of those decisions that made us really happy, and probably a birthday gift to him that he'd really appreciate, and how can we not, we had the rest we needed with added bonuses all thanks to Ted's Bed and Breakfast, Sta. Cruz, Laguna. Behind the famous go-to diner for comfort food- Ted's is a huge compound with an event venue, perfect for weddings, birthdays and corporate events, and behind that is a gated place with 7 mini-villas. The event place used to be a warehouse, inside it's like a huge barn house with wooden tables and chairs. Please, with my photos, allow me to be your guide. You enter through this quaint gate, as if you're visiting your granny in the province. You will see this on the right, Piko, the Filipino hopscotch. After arranging our booking at Ted's cafe, we were given our key. After which we were handed over a paper for our other requests, one is the menu for our breakfast the next day. On the same paper, here is just the cutest service ever. They have a complimentary midnight snack and you can choose from tea, hot choco and some cookie treats. "Simplicity is the ultimate sophistication," as da Vinci would say and their rooms speak humbly of it. Sometimes, we don't need luxurious escapes, specially if you're on a budget. Inside was a mix of cold and warmth. It's like being ina country cottage with building structure made of stone walls, and with a wall dividing the bathroom in wooden pallet. It would however be extra comfy if they added country-inspired headboard. I also love their lighting fixtures. The bed was bit small for us, which meant we needed sleeping close to each other, which I never really mind, though I kinda having an impression we got used to queen-sized bed. I love that there isn't so many colors in the room, white linens give that serenity we were really striving for and it's perfect for grabbing a book or a Bible and getting your focus to your reading. Two bottled waters were also provided. The room is AC'd and provided with a cable and TV. One drawback though is that the TV is too far up which most of us aren't fond of watching in that manner. But hey, weren't we there to rest and sleep? The bathroom was ok, and has that industrial look to it, or am I just expecting modern tiles when I opened the door? 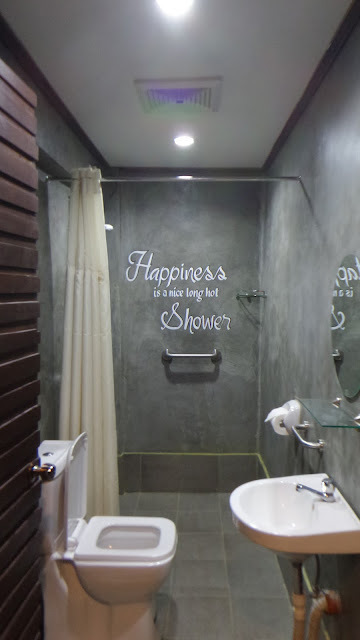 But apart from the hygiene kit and hot shower provided, the wall calligraphy made it a special sanctuary. After checking out our room, and had a shower and quick nap, we had dinner at Ted's and that's another one awesome story worth of it's own blog. So we snoozed soundly after dinner, as expected. I left our room early to roam around Ted's vicinity and sure does have a lot of interesting things to do here, and they do have a lot of more improvements to do in the future. For their wedding debut clients, the vicinity has lots of interesting nooks for that Instagram-worthy shots. There are lots of seating even outside the resto. Outside, the old gas filling station was placed giving it a great conversational piece. This was an old gas refilling machine which the Salonga's have own decades ago, which used to be outside the old "Aurora Filipino Cuisine" at the town center of Sta.Cruz, Laguna. Aside from getting your breakfast here, you don't need to stop by anywhere else to buy pasalubong. Inside the vicinity they also have a bakeshop which is also the commissary for all their baked products including beautiful cakes for all occasions. This is where Pastry Chef Gel Salonga does her magic. Look at that glorious sunlight reflecting on our table. My plate was filled with all the good things I would ask for in a complete healthy b-fast, sunny-side egg, fried danggit and sinangag garlic rice. I would definitely love it if it has tomatoes and yes, Ted's even made it extra special with bits of "kesong puti" (local buffalo cheese) and pesto. Bhogs on the other hand, had Beef Tapa with eggs over fried rice, and I ate his share of tomatoes with pesto and kesong puti. Kesong puti, is an industry slowly dying in Laguna. a typical delicacy mainly made and sold in Sta. Cruz, is a kind of cheese that doesn't need to be aged. It's white, odorless with a slightly salty flavor, made from native carabao’s milk. It can actually be eaten right after the milk curds. So whenever you make a visit to Laguna up to Pagsanjan to Lusiana, why not make a side trip to Sta- Cruz and buy some kesong puti. Waking up to a good weekend morning, fully-rested and over a hefty and yummy breakfast is just so unbeatable, specially if you're with the one you love. Ted's is just along the main highway and you won't miss the cozy cottage-like place with an orange label. Make sure to check out for your self why they are always fully-booked and why they are stay-cationers' favorite. One night stay complete with all the bare necessities costs only P 2900, breakfast and midnight snack is covered already. To see their rules and regulations click here. When you want to do waterfall-cashing at Hulugan Falls, Luisiana, Laguna, which is about 30 minutes from Ted's click here.